Joey King is only 19, but she’s already got a résumé filled with notable acting credits. 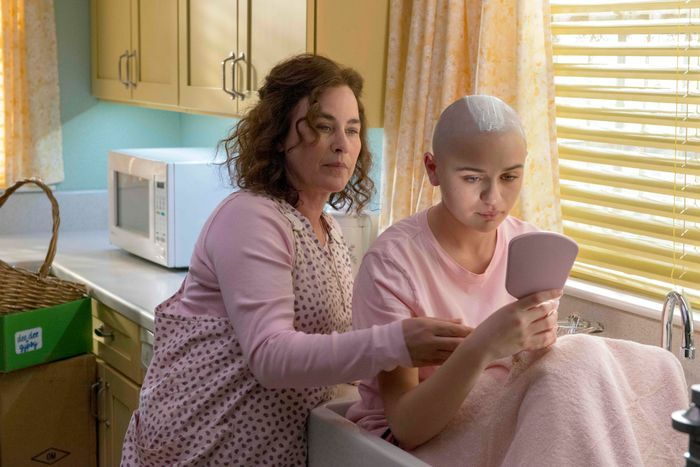 She played Ramona in Ramona and Beezus, the daughter of Steve Carell and Julianne Moore in Crazy Stupid Love, a member of the literally haunted Perron family in The Conjuring, and, more recently, the lead point in the high-school love triangle of Netflix’s The Kissing Booth.But in Hulu’s The Act, which premieres Wednesday, King takes on her biggest acting challenge yet: Gypsy Rose Blanchard, a wheelchair-bound, seemingly medically frail child who misrepresented herself at the insistence of her controlling, abusive mother, Dee Dee (Patricia Arquette). The true story of Gypsy Rose and Dee Dee — a story that veered from years-long fraud to violent murder — rose to prominence when Act co-creator and co-showrunner Michelle Dean wrote about it in a 2016 BuzzFeed feature. During a recent phone call, King talked about how she approached playing this very real, unique woman, the psychology of Munchausen syndrome by proxy, and the relationship she developed with Arquette during filming. I’m curious about how you got the role of Gypsy. Was there an audition process for this? ﻿Yes, I did audition for this role, which I’m very, very thankful for. I think with a role like this, you have to audition because it’s a role that requires a lot of care and a lot of commitment. It’s very demanding. When you auditioned, how much did you know about Dee Dee and Gypsy and their story? ﻿I had heard about the case and I remember being like, “This is crazy.” When this audition came around, I was like, “Oh my God, I have to watch this documentary now and do research.” So I really immersed myself into the research process. I was very, very nervous, too, so I’m happy that my nervousness didn’t come through too much. Do you go in for that audition wearing glasses and trying to look as much as you could like Gypsy? How did you prepare for it? ﻿Preparing for the audition was interesting, because they didn’t want me to do the voice. Yeah, I remember being like, “Oh okay, I won’t do the voice.” But I was trying to still emulate her energy. When it came time to actually being asked if I wanted to play her, I told them, “You guys, I can do the voice if you want me to.” And they’re like, “Oh, you can?” And I’m like, “Yes! I think it’s really important.” They’re like, “Oh okay, great. Then we do, too.” I’m very happy that I was able to do her voice and become her more completely. Talk to me about that. I was really interested in how you settled on the right pitch for her voice. She was known for talking high and childlike. But how did you figure out the right way to do that? ﻿It’s just doing your research — watching videos, listening to her speak, and just really trying to get it in my brain as much as possible. As an actor, you’re trying to delve into the psychology of the person that you’re playing. What’s challenging with Gypsy is that she seems to understand on some level that she’s faking at her mom’s behest, but then at the same time, she doesn’t because she’s been brainwashed. How did you wrap your mind around that? ﻿It’s hard for me to wrap my mind around all that as well. I think Gypsy was confused herself. I think she knew that she could walk. For a long time, that’s all she knew. And then she slowly tried to find out more things — she’s her mother’s daughter, in that she also had to use manipulation to get what she wanted. It’s not really her fault that’s the role she had to play. She was really good at manipulation because she was forced into these scenarios where she had to manipulate to survive. There’s a moment in The Act where Dee Dee is trying to get Gypsy to sign some papers and she says, “Now you’re an adult and you can potentially go to jail, too, if anyone finds out about this.” This is going to sound weird, but it reminded me of Leaving Neverland, the Michael Jackson documentary. Because he would do something similar with those boys. Abuse victims just internalize this sense of, I can’t betray this person. It’s hard for other people to understand the impact it has on you. ﻿Absolutely. People keep asking Gypsy, Why didn’t you just stand up? Why didn’t you just say something? It’s really not as simple as that. When she talks about the reason that she had her mom killed, she says that she didn’t want her mom to go to jail because she knew her mom hated jail. On the other hand, Gypsy knew that if she just ran away, it would emotionally wreck her mother. So she thought by killing her, she was doing the nicest thing she could do. You know what I mean? She didn’t want to betray Dee Dee and she didn’t want to hurt her emotionally so she thought, I just have to get rid of her. It’s so bizarre, but once you watch the show, you’re like, Okay, I guess I see why you would think that. But it’s crazy that’s the logic she settles on. Talk to me about working with Patricia Arquette. Had you ever met her prior to working together? No, I hadn’t, and I can tell you that working with her was the greatest experience of my life. She’s such a generous actor and a generous human being. Working with her was so eye-opening in so many ways. Did you guys build a relationship outside of doing the work on set? Like, did you spend time with each other? Patricia and I, we met prior to the start of shooting in L.A. We met for dinner with one of our directors. But I think our real relationship started when we started rehearsing together, diving into the crazy and horrid mentality of these characters. We really became emotionally reliant upon one another and I’m so happy that we did because I feel like she’s like family to me now. I text her and I call her whenever I just feel like talking. You mentioned her generosity as an actor. What were some of the generous moments you can remember from working on this? There was this big scene in episode three, where I really defy her for one of the first times. It was my close-up. It was a very, very difficult scene and — because this is a scene where I’m supposed to feel super super smothered by her and just wanted to get away from her — I remember Patricia could sense that I was nervous. Without saying anything, without me asking, without anything, she came to me and she pushed my arm down by my side and she hugged me super tightly but wouldn’t let me go. I started to feel a little claustrophobic and a little bit panicked. It was so helpful and smart of her to take that cue from me. She could read me better than I could read myself. You didn’t get a chance to talk to Gypsy in jail. Why was that? ﻿Legally, there were just like so many reasons that I don’t understand. But I was just legally not able to discuss anything with her. Would you want to talk to her at this point? I’ve never really been asked that before. I think I would, but I don’t know, it would be really crazy to talk to her at this point. When you were shooting this show, was it hard to go home for the day and shake all of this off? ﻿Yeah, there were days with the heavier stuff further into the season, I would go home and I would take it with me. But most of the time, I was able to leave it at set. There were certain days when I was like, Oh man, what a day. That’s the mentality that’s still hanging around. I would have to shower it off with some cheese and crackers and some nice reality TV. What was the hardest day to shake off? There were a few. There was a day where Patricia and I had to fight and it took a really big toll mentally on both of us — that day was really hard. There was a very, very specific scene in episode eight that was the most draining scene I’ve ever done. When I went home, my head hit the pillow and I was completely out.